Although many games introduced their new updates and expansions in October, such as Guild Wars 2, SWTOR, TERA, and Wildstar, their impact was not that significant. It only resulted in an average of 10% increase in price. And it should only last for a short period of time. Sadly, World of Warcraft Gold price was starting to decrease again in October and it might not stop unless there's a major update from Blizzcon in November. ArcheAge gold price in October was quite fluctuating although the game didn't have any update. The average price during October was slightly higher than the previous month but it should drop again in November unless the game has an event to bring gamers back to the world of Erenor. The cheapest was on October 2, 2015 which is 2,000 ArcheAge gold for $42.98 and the most expensive was on October 23, 2015 for $50.56. It was 17.64% different. 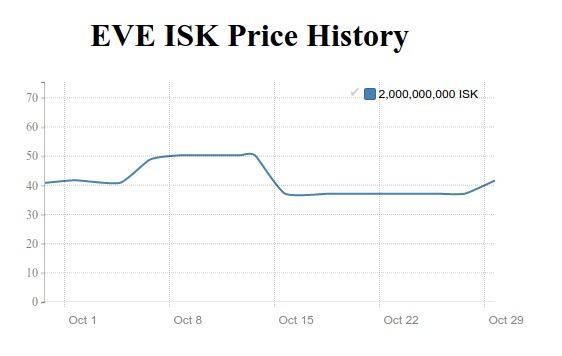 EVE Online ISK price had a significant increase as soon as the Vanguard update was released on October 6, 2015 coming with a beta test for a new launcher system. However, the rise in price only lasted for a week and rapidly dropped to $37.14 per 2bn EVE ISK. It stayed in this range until its sudden 10% increase at the end of the month. This increase should only last for a few days before it returns to the original range again in November. The cheapest was on October 23, 2015 which is 2bn EVE ISK for $37.14 and the most expensive was on October 14, 2015 for $50.28 USD. The discrepancy was as high as 35.38%. The impact from the Heavensward update has finally stopped in October. FFXIV Gil stayed in the range of ~$19 USD per 5m gil for the whole month which was around the same range before the release of FFXIV major patch update in July 2015. It is expected to be in this range until its next event in December. The cheapest was on October 21, 2015 which is 5m FFXIV gil for $18.60 and the most expensive was on October 02, 2015 for $21.18. It was 13.87% different. Star Wars the Old Republic just released another digital expansion “Knights of the Fallen Empire” on October 27, 2015 coming with the Knights of the Fallen Empire storyline. 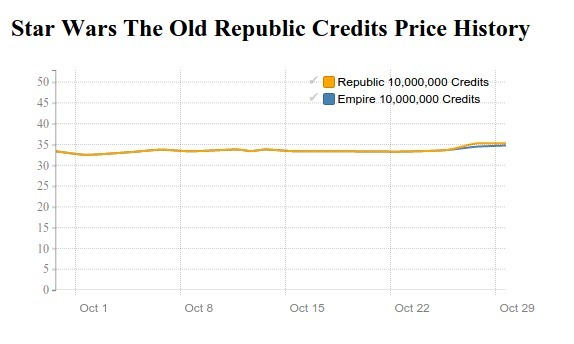 This resulted in a slight increase in SWTOR Credits price after it has been staying in almost the exact amount of $33.32 per 10m Credits since the beginning of the month. All in all, the increase should not last long until it returns to the original state. It even has a chance to be slightly lower than ~$33 USD at the end of November. The cheapest was on October 2, 2015 which is 10mn SWTOR US Credits for $32.50 and the most expensive was on October 28, 2015 for $34.73. It was 6.86% different. Thanks to the Lost Isle on October 13, 2015, the latest update with a new pvp arena, new character creation system, and more, the average TERA gold price was about 10% higher than the previous month. And the price was almost 20% higher a few days before the launch of this update after its slight decrease. Then, it stayed in this range for the whole month. However, the effect from the Lost Isle should only last for a month and TERA Gold price should go down to the normal range again in the middle of November. The cheapest was on October 5, 2015 which is 20,000 Tera Gold for $25.98 and the most expensive was on October 9, 2015 for $30.19. It was as high as 16.20% different. WildStar US Gold price was higher than the previous month because of the overhaul on September 28, 2015 called “WildStar Reloaded”. Its effect was quite the same as the Lost Isle for TERA resulting in 10% more in price. However, there were two times the gold price had a sudden ~10% drop for a day with an unknown reason. Then, WildStar has been working on various marketing events for the whole month but it didn't change its gold price much. Same as TERA, the effect of the new update should last only for a month before the price returns down again in the middle of November. The cheapest was on October 9, 2015 which is 5,000 gold for $46.95 and the most expensive was on October 2, 2015 for $58.47. It was 24.54% different. 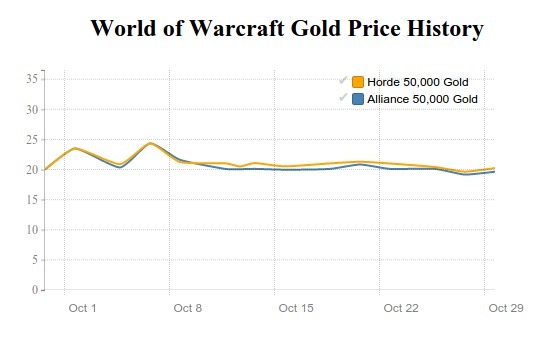 World of Warcraft Gold price was on the decrease again comparing to previous months. It was about 15% lower than September. Gold price was slightly fluctuating on the first two weeks before it had been slowly decreased until the end of the month. There was nothing really interesting for the World of Warcraft in October since Blizzard is focusing all their strength for the upcoming Blizzcon on November 6-7, 2015. Until the event, the decrease in price should not be easily ceased. The cheapest was on October 16, 2015 which is 50,000 gold for $19.84 and the most expensive was on October 7, 2015 for $24.95. It was as high as 4.29% different.